I dropped the car off for yet another expensive repair today (I don't want to talk about it.) and on the walk to work afterwards, I came to Frame Park in Waukesha. For some reason, I was stricken with a pang of nostalgia for my days as a young father. My two kids and I spent A LOT of afternoons and early evenings at this park. Any of you who have slogged through the days of multiple small children know that going to the park is like a micro-atomic vacation from the rigors of parenting. 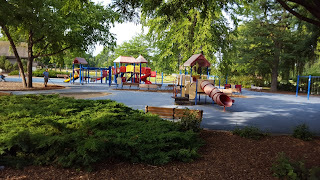 For the most part we get to turn our kids loose and let them run feral around a dizzying array of dangerous, perilous playground equipment while we try to use at least part of that time gathering our wits and trying to remember what day of the week it is. I used to play "Monster" with my kids at this park, where when they got bored with the other kids, they'd make me chase them around the park. Up the ladders (with my 6'5" frame) and down the slides, just slightly behind them to get them running and tired out. It was all fun, but it was also a parental sneaky-ploy to run the energy out of them so they'd be tired out and fall asleep easier at bedtime. It never worked out that way. But I miss their small bodies. I miss their screams of fear when I would start after them in a chase. I miss watching them interact with other kids on the playground. There were a fair amount of regulars at the playgrounds - other parents looking for a micro-atomic vacation from the confines of their own homes, just like me. But as much as I long for those days, these days are pretty good too. I don't have the physical rigors of feeding, lifting, changing, buckling, bathing, pottying and dressing anymore. I do get nights like two nights ago though. "Evidently the washer is in the Raiders of the Lost Ark Warehouse." I cracked up so bad. How did I get to a point between big boy pants and the sarcastic wit of a 17 year old like this? This is the beauty of having kids who are turning into adults. I get someone who gets my sense of humor, can crack me up and doesn't mind a little heavy lifting. And I thought, how nice is it that I not only have free back saving help, but we can have fun doing a task that one doesn't usually associate with fun. The same goes for Sarah when she brings her stories of babysitting home with her. She tells me how cute little Levi (age 3) is when he says, "I'm not really tired for a nap." Also, she is right there alongside us laughing and holding doors open when Laurel and I are wrassling the new washer into the house. So, it's a trade-off, I guess. I don't get to dance and wrestle with the kids on the living room floor any more, but I get these times of "life," of living day-to-day average, ordinary life, with moments of great fun and unexpected laughter that make me realize it's all a great journey. Moments of family love - albeit unintended. And I will take every one of those that I can get these days.